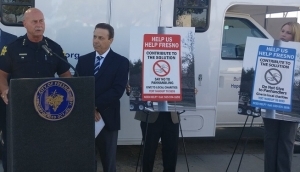 FRESNO (KMJ) — Another proposal to combat panhandling in the City of Fresno has been unveiled by Councilmember Garry Bredefeld. 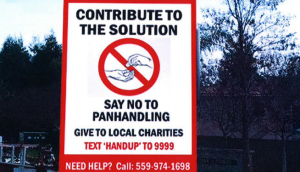 The “Help Us Help Fresno” initiative would encourage passing motorists to give to non-profits instead of directly to those standing at intersections. It comes after the STOP ordinance (Safe Transfer of Objects to Pedestrians), proposed by former Councilmember Steve Brandau, was rejected by Fresno City Council last month (click here to read more). Critics suggested that it criminalized people asking for money instead of assisting those in need. “There’s a better way to help people than give them a dollar, couple dollars, change. It is really helping local charities who are actually involved in doing the work,” said Bredefeld. The proposal has the support of Councilmembers Paul Caprioglio and Miguel Arias, as well as Fresno Police Chief Jerry Dyer. The announcement at Fresno’s Blackstone and Herndon was also attended by people opposed to the idea. Protestors asked if the money could go towards funding a dedicated low-barrier shelter for those who cannot live by the rules of the established centers. Responding to him, Councilmember Miguel Arias said that such a place is coming. The “Help Us Help Fresno” proposal will be submitted to Fresno City Council on Thursday.